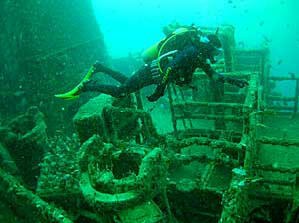 Here are some areas to visit on a day trip while staying with with us. We are located in the heart of an exciting stretch of Northland coastline, just 20 minutes driving from Whangarei. A coastal area where man and nature combine to provide a whole host of things to do, swimming, boating, fishing, surfing, scuba diving, sight seeing, line fishing trips, deep sea fishing, exciting beaches to discover and explore. An exciting new experience awaits you when you explore the beautiful bays of the Tutukaka coastline. 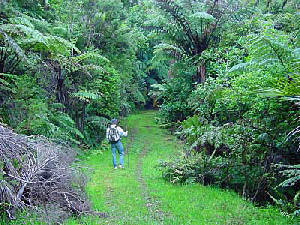 We have on our property several bush tracks that our clients can visit. 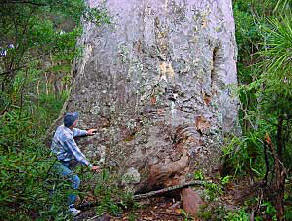 See "Goliath" Tutukaka's giant kauri tree. The entrance to Tutukaka reserve The entrance to Tutukaka reserve is a short distance along the Matapouri Road , from the Tutukaka Store. You will need an outgoing tide to walk across the rocks to reach the lighthouse. The views are well worth the effort. Ten minutes north from Tutukaka the visitor is welcome to peace and tranquility by the golden sands of Matapouri Bay. Nestled among bush-clad headlands, a magnificent half-moon shaped bay with the open ocean peeping through the entrance. Great surfcasting. Only 1/2 km (by road) beyond Matapouri is a delightful walk through native bush reserve to Whale Bay, used by early Maori tribes during their whaling expeditions because of the calm waters. This bay and the bush walk is one of the most beautiful examples of coastal scenery. 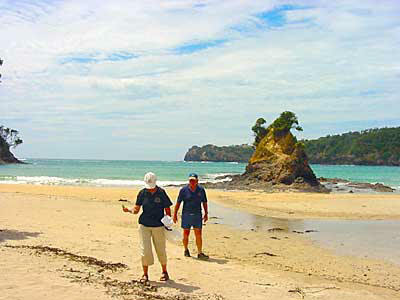 1.5 km further on is Sandy Bay, one of the most popular surfing beaches on Northland's east coast. There is always a good wave at Sandy Bay. In fact it usually has a wave at least a foot or two higher than most other beaches. Pacific Bay is located in the Tutukaka harbour. This is a popular safe beach accessed from Tutukaka Block Road. Turn off Block Road left into Dolphin Place, a few meters along on your right is the walking track, a short climb to the top for superb views up and down the coast. Locally known as Wellington's Bay, is at the end of Tutukaka Block road. At the far end of the bay a walking track climbs the hill for a good view of the Ngunguru entrance and the sand spit. At low water you can walk to Ngunguru. Fishing from the rocks at both ends of the bay can be productive. The Bistro and Bar (public welcome) at Whangarei Deep Sea Anglers Club, Snapper Rock Restaurant, Wahi Restaurant, Ngunguru Sports Complex. Marina Pizzeria, Ngunguru Fish Shop. 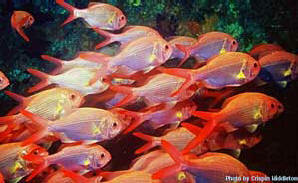 Charterboat listings at Deep Sea Anglers Club. Claphams Clock Museum, Whangarei Museum and Kiwi House, Kauri Clock Factory, Whangarei Heads, Town Basin. Fern house New Zealand's largest public fern collection. Marsden Point Refinery Visitor's Center, Swimming, Surfcasting. Museum on Nova Scotia Pioneers, Waipu Cove, Surfing and fishing, Old firehouse art gallery. Brynderwyn Hills horse trekking. All water sports. On scenic route. Excellent museum featuring early Northland and the history of Kauri. A must.